Preheat the oven to 180°C/355°F. For the base, mix part of the cold, cubed butter, sugar, milk, and a pinch of salt together. Next, add flour and work into a smooth dough. Roll the dough out thinly onto a work surface sprinkled with flour. Leaving an edge, lay into a tart tin (greased if necessary). Weigh down with baking paper and baking beans. Next, blind bake in a preheated oven at 180°C/355°F for approx. 12 - 15 min., until the base is golden. Meanwhile, chop part of the dark couverture and put in a bowl with another part of soft butter. Bring part of the heavy cream to a boil and pour over couverture and butter. Let it sit for 1 - 2 min. and then beat with whisk until smooth. Add egg whites, eggs and a pinch of salt to the chocolate mixture and whisk. Pour the smooth mixture onto the baked base and bake the whole thing at 180°C/355°F for approx. 25 min. Leave to cool down to room temperature for approx 1 hour. For the ganache, chop remaining couverture and put in a bowl with remaining butter. Next, boil cream and pour over the couverture and butter. Allow to steep for 1 - 2 min. and then whisk until smooth. 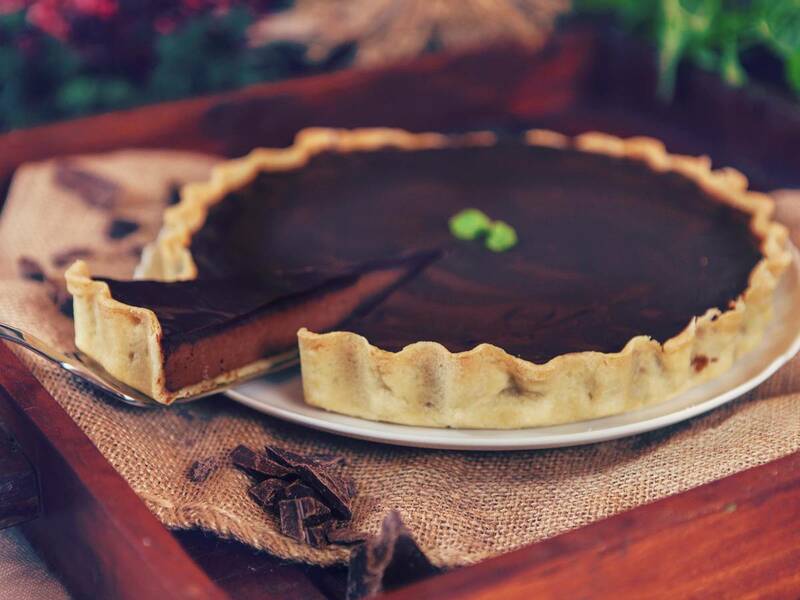 Spread the ganache over the cooled tart. Chill the tart for at least 1 hour before serving. Serve with a garnish of cream and fresh berries, as desired.